It's actually not the first time Kellogg's has dabbled with a crispy, strawberry-flavored cereal. Cereal that snaps, crackles and pops is nothing new, but a new flavor of the ever-popular Rice Krispies certainly is. In fact, the brand hasn't debuted a new flavor in 10 years. In 2019, however, fans of fruity cereals will be in luck. The latest upgrade on a classic breakfast is Strawberry Krispies which, according to Kellogg’s, will be joining the original, Cocoa and Frosted varieties on store shelves next year. On Twitter, people are already going gaga over the flavor combination — and the millennial pink hue. Of course, this flavor isn't as wild as the recently announced Sour Patch Kids cereal (sour milk, anyone? ), but it definitely seems as if fruit-flavored cereals are making a comeback. Trix even recently brought back its fruit shapes from the 1990s. 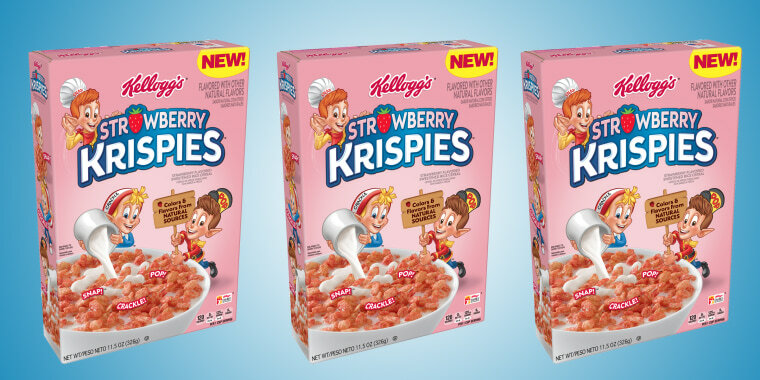 Kellogg’s new Strawberry Krispies will be available nationwide in January 2019, with boxes retailing for about $4. But is the cereal entirely new? Not exactly, because it turns out that a version of this cereal existed way back in 1983. Of course, back then it wasn't as brightly colored and it was only on store shelves for a limited time. A representative for Kellogg's told TODAY Food that the strawberry cereal that's being released in 2019 has a completely different recipe than its old predecessor. In addition to the new Rice Krispies, Kellogg's Frosted Flakes cereal will also be getting a sweet makeover in two new flavors: Banana Creme (we told you fruit was in!) and Honey Nut.